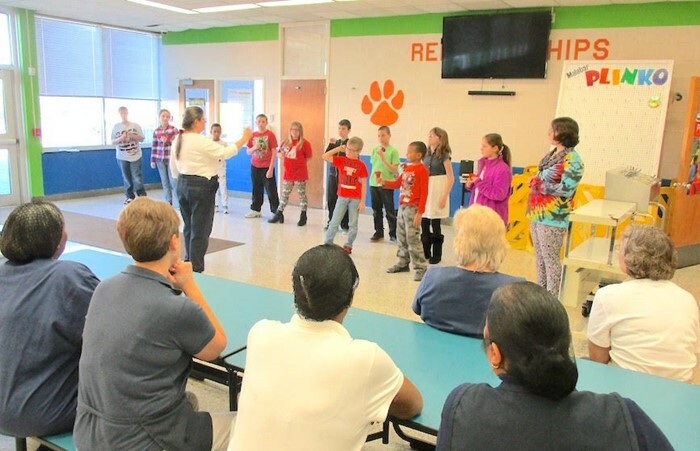 The Malabar Intermediate School handbell choir, shown here entertaining the cafeteria staff in December, will perform at Wedgewood Estates on May 21. All buildings will be closed April 19-26 during Mansfield City Schools’ spring break. There will be 26 class days remaining when normal schedules resume on Monday, April 29. Schools will be closed on Memorial Day, May 27. The last day for students will be Tuesday, June 4. Here’s a list of scheduled final-month activities at each school. Lists may not be complete. For more information, call your school. May 31 – Third-grade graduation 2 p.m.
May 21 – Handbell choir will perform at Wedgewood Estates at 9:30 a.m.
May 15 – Boys to LeaderRichland at OSU Mansfield. May 17 – Eighth-grade social in the commons.